It took a little longer than I thought (thanks to MS Word issues) but the re-edited version of the e-book is now up on the download page. There is no new content in this version, just a few changes thanks to a great (and third) copy edit. Fixed some typos and a few formatting errors. The new PDF is on the original download page, if you can't find the email with the URL, use the email link in my profile here to send me a note with your name and I'll get back to you. Don't miss this Thursday's meetup—"Content Strategy: What's In It for You?" at 6:30 PM at Ignition Alley. Drawing cues from this year's heightened focus on content strategy, Margot Bloomstein will address how content strategy differs from just copywriting and how you can incorporate insights from this aspect of interaction design into your next project. Discover how the questions a content strategist brings to the table can enrich your deliverables, learn how your collaboration can benefit your end users, and discuss ways to reframe the RFP to upsell content strategy in your next pitch and bring a new partner into the project. If you're a designer, IA, search engine marketer, or any type of social media or web strategy consultant, learn how insight to content strategy can rock your work from a new angle. 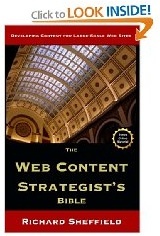 The Web Content Strategist's Bible was unavailable for a few days while I was having it re-edited to get rid of a few typos and formatting issues. But everything has been taken care of and it is back up and available for purchase. Gotta love the speed of electronic publishing. Well it's a new year and a good time for housekeeping. The biggest problem in writing a book for writers and editors is that no typo or error goes unnoticed. Thanks to all of you who took the time to write me about errors and formatting issues! I'm not being sarcastic, really thank you, I would hate for anything to detract from the message of the book. But the best way to thank you guys is to take the time to actually fix the problems. So I sent the book out to a super copy editor (if you need a copy editor, let me know and I'll put you in touch) and cleaned up everything we could find. The corrected online PDF version will go live in a day or two. I'll post here when the files are changed. Thanks for your patience, the printed book will be available again in just a few days. The 2010 STC Summit will have a number of content strategy components. Rahel Bailie has posted a nice summary of the Content Strategy progression that lists the sessions and presenters . As a metadata geek, I'm particularly interested in Rachel Lovinger's session on The Role of Metadata in Content Strategy.